Attractive Ruth Niehaus (1925–1994) was a German stage and film actress, who often played the femme fatale or 'the other woman’. She was dubbed the ‘Rita Hayworth of the German film of the 1950s’ and was regarded as a ‘Fräuleinwunder’. West-German postcard by Kunst und Bild, Berlin, no. I 452. Photo: CCC-Film / Constantin-Film / Grimm. 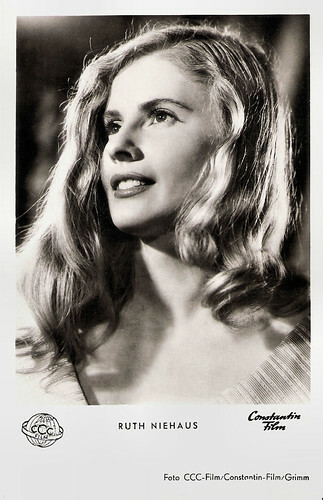 Publicity still for Studentin Helen Willfüer/Helene Willfüer (Rudolf Jugert, 1956). West-German postcard by Ufa, Berlin-Tempelhof, no. FK 4113. Photo: Lilo. Ruth Hildegard Rosemarie Niehaus was born in 1925 in Krefeld, Germany. Her parents were Elisabeth Niehaus, born Nettesheim, and the engineer Fritz Niehaus. Her brother was the Munich surgeon Helmut Niehaus. After completing her high school diploma in Dusseldorf, she attended the drama school there under Peter Esser. Her stage career began at the Stadttheater Krefeld in 1947-1948, followed by engagements at the Deutsche Schauspielhaus in Hamburg (1948-1949), at the Oldenburgische Staatstheater (1949-1950) and in Düsseldorf under the direction of Gustav Gründgens (1952-1954). She played both in classical and modern theatre. The press called Niehaus a ‘Fräuleinwunder’ a term for young, attractive, modern, self-confident and desirable women of post-war Germany. 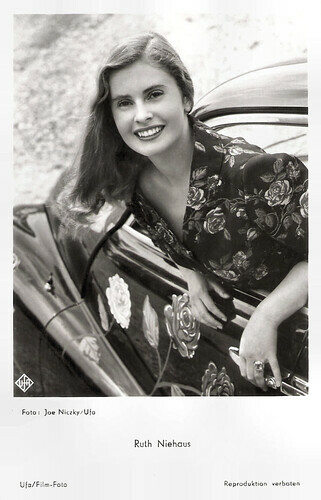 In 1950 Ruth Niehaus reputedly spurned a marriage proposal from Orson Welles, and with it the chance to work in Hollywood. She did marry Ivar Lissner, a Jewish German journalist and best-selling author, who had been a spy with the German Abwehr during World War II. Niehaus made her film debut in the West-German comedy Das Haus in Montevideo/The House in Montevideo (1951). It was directed by Curt Goetz and Valérie von Martens who also played the leads, while Niehaus played their daughter. The film is an adaptation of Goetz's 1945 comic play of the same name and Goetz and von Martens had already frequently played their parts on stage. Niehaus next played a supporting part in Heidelberger Romanze/A Heidelberg Romance (Paul Verhoeven, 1951) starring Liselotte Pulver, O.W. Fischer and Gardy Granass. She then co-starred with Ivan Desny and René Deltgen in the drama Weg ohne Umkehr/No Way Back (Victor Vicas, 1953). It was made at the height of the Cold War. In 1945 following the Battle of Berlin, a Red Army officer (Desny) is able to protect a young German woman (Niehaus) he finds living in a cellar. Several years later he returns to the city as a civilian, finds her again and makes plans to flee from East to West Germany under the noses of the KGB. 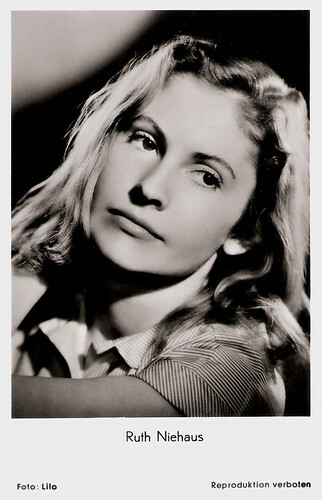 For this role she won in 1954 the Bundesfilmpreis (German Film Award). Other films followed, such as Rosenmontag/Love's Carnival (Willy Birgel, 1955) with Dietmar Schönherr, and Auferstehung/Resurrection (Rolf Hansen, 1958) starring Horst Buchholz. West-German postcard by Kolibri-Verlag, no. 693. Photo: Panorama-Film / Königfilm / Hochreiter. 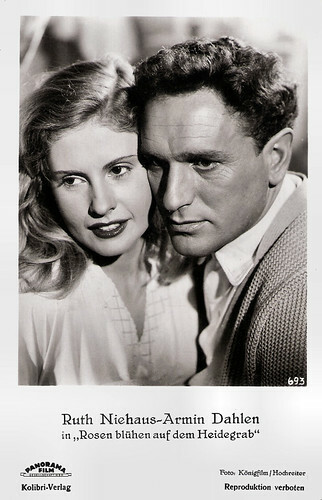 Publicity still for Rosen blühen auf dem Heidegrab/Roses Bloom on the Moorland (Hans H. König, 1952) with Armin Dahlen. German postcard by Franz Josef Rüdel, Filmpostkartenverlag Hamburg-Bergedorf, no. M 2482. Photo: Ringpress / Vogelmann / Bavaria. 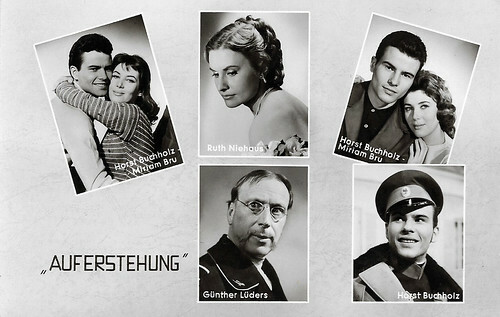 Publicity stills for Auferstehung/Resurrection (Rolf Hansen, 1958) with Horst Buchholz, Myriam Bru, Ruth Niehaus and Günther Lüders. In 1959, Ruth Niehaus co-starred with Helmuth Schneider in the Argentine film Cavalcade (Albert Arliss, Richard von Schenk, 1960). At the beginning of the 1960s Niehaus largely withdrew from the film business and only sporadically took on roles in film and television productions. In 1980, she played a supporting part in the West German drama Fabian (Wolf Gremm, 1980), based on the novel by Erich Kästner. On television she played guest roles in Krimi series like Der Alte/The Old Fox (1978) and Tatort (1983). Her main focus was on the theatre. At the Festival in Bad Hersfeld, she was celebrated as ‘Das deutsche Gretchen 1959’ in Goethe's Faust under the direction of William Dieterle. In 1961 and 1962, she also played Titania in Shakespeare's A Midsummer Night’s Dream, directed by Dieterle. From 1964 to 1968 she worked under the direction of Oscar Fritz Schuh at the Deutsche Schauspielhaus Hamburg. In Hamburg, she brought the present author Jean Cocteau to tears with her depiction of Eurydice in his play Orpheus. These years at the Deutsche Schauspielhaus in Hamburg were her most successful stage period. In 1968, she left the house together with Oscar Fritz Schuh and performed further roles in his productions. Until his death in 1984, Schuh was one of her closest friends. In 1987, Ruth Niehaus was able to celebrate her 40th stage jubilee. That year she also directed Rebecca at the Münchner Kammerspielen. She remained on stage until 1992. She incidentally played in films, such as in Hard Days, Hard Nights (Horst Königstein, 1989) with Al Corley. Her last film role was in Wir können auch anders/We can also differently (Detlev Buck, 1992). In 1994 she and Christa Auch-Schwelk were honoured for their documentary Jeffrey – Zwischen Leben und Tod/Jeffrey – Between Life and Death with the media award of the AIDS-Stiftung (German AIDS Foundation). 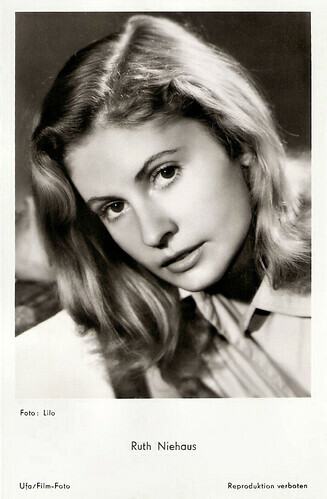 Ruth Niehaus died in 1994 in Hamburg. She was 69. She and her husband Ivar Lissner, who passed away in 1965, had a daughter Imogen (now Imogen Jochem). West-German postcard by Ufa, no. FK 2177. Photo: Joe Niczky / Ufa. West-German postcard by Rüdel-Verlag, Hamburg-Bergedorf, no. 1297. Photo: Lilo. Sources: Wikipedia (English and German) and IMDb.